This V-shaped shawl is not difficult to knit, but it will keep your attention! The 2-row stitch pattern is adapted from Barbara Walker’s Charted Knitting Designs. The shawl needs no edging, unless you desire one - as knit, it is non-curling. 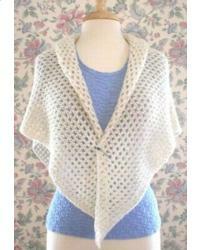 In this lovely alpaca yarn, it is a luscious coverup for cool spring days and summer evenings. It is sampled in Kraemer Yarns Alpaca, a 100% North American alpaca yarn, in a DK wt. Note: Kraemer Yarns has improved their lovely domestically-sourced and produced alpaca yarn by adding 30% merino wool, so it is now 70% alpaca/30% merino wool.